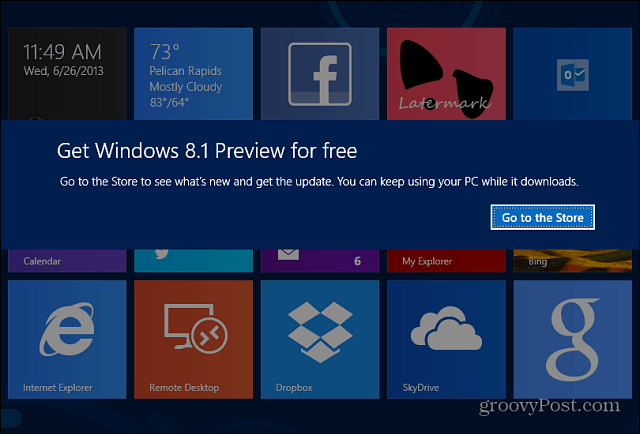 Microsoft made the much anticipated Windows 8.1 preview available yesterday. It’s a free download and can be installed a couple of different ways. Microsoft started its Build Developer Conference this week, and being a crazy Microsoft fanboy, I was excited to get my hands on the new Windows 8.1 preview. 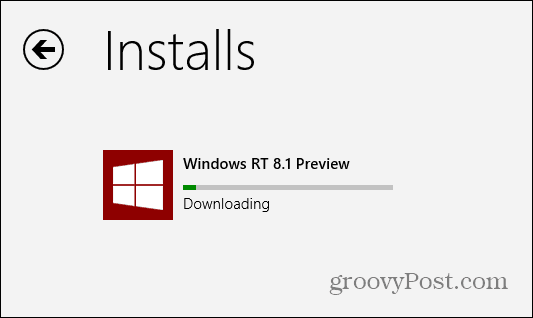 If you want to update your Windows 8 or Windows RT system to the new public preview, there’s a couple ways to do it. Here’s a look at the steps I went through to update my Surface RT via the Windows Store. Then I cover what you need to know if you’d rather use the ISO, which is available as a separate download. Note: Before updating, make sure to read my article on what you need to know Before doing an upgrade. This version is a Preview, and not the official final release. I don’t recommend updating your system if you only have one computer running Windows 8 unless you’re a power user and know what you’re doing. For this article I am showing the update process for my Surface RT. I also updated my Lenovo ThinkPad – running the full version of Windows 8 Pro – and the steps are virtually identical. 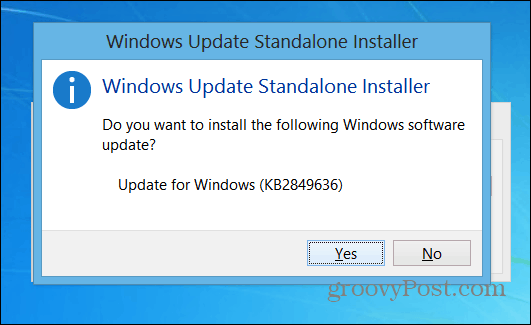 Using the standalone install is probably the easiest way to update. 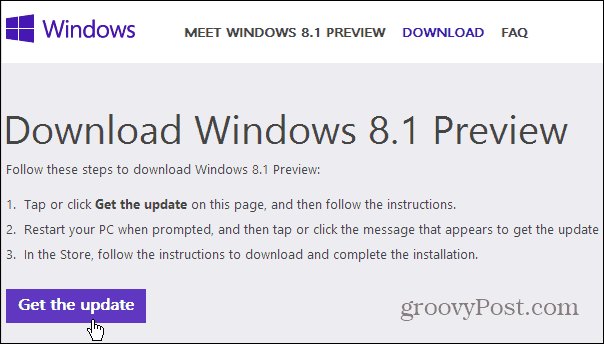 First head to this Microsoft site to download Windows 8.1 Preview. Click the Get Update button to download the Windows8-RT-KB2849636-x64.msu file. Then install the standalone installer, it just takes a second or two and when it’s done, you’ll need to restart your computer for the update to take effect. After your computer restarts and you log in, you’ll see the following screen. Tap or click Go to the Store. The Microsoft Store will launch and you’ll see more information on the Win 8.1 update and start the download. It takes quite a while for the update to download, but you can keep using your computer normally while it is. A message will pop up when you need to take more actions with it. After the preview is downloaded, you’ll get the following screen. Make sure to back up anything you’re working on and the computer will restart a few times during the update. Your computer will restart a few times, so be patient. When it’s ready, you’ll need to work through a setup wizard, similar to the one you worked through when first installing Windows 8. You need to select between express or custom set up, enter your Microsoft account email and password, security codes, and a few other settings. It’s straight-forward, just follow the onscreen instructions. After that, you’re done! Here’s a shot of the new Start button available on the desktop view on my Surface RT. 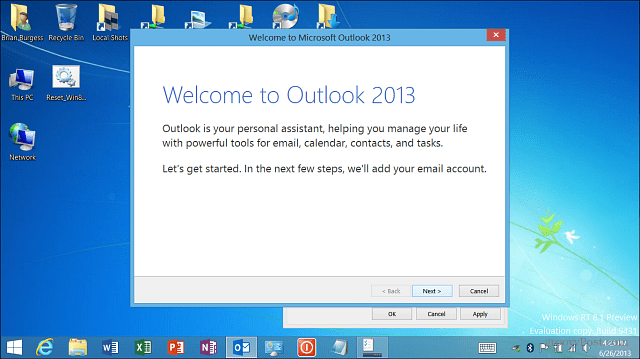 Also Notice it now has Outlook 2013. It’s free and part of the update. Previously Windows RT only had the Mail app – which was less than decent for email, to say the least. If you don’t want to update over the web, you can also download a separate ISO file. 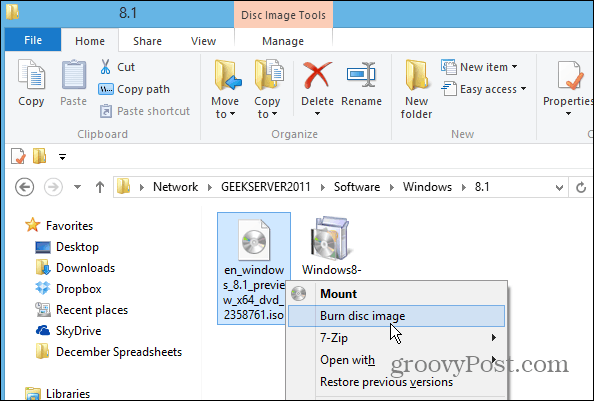 That lets you install it at your leisure from a DVD or, my favorite way – by creating a bootable install flash drive. Or with an ISO (3.5GB)you can run the new version on a virtual machine on Virtual Box or by creating a VM on a Windows 8 system with Hyper-V. 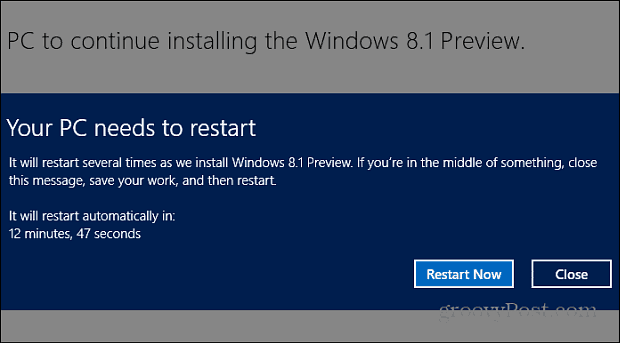 If you’re running the Enterprise edition of Windows 8, and want to update, you’ll have use the ISO method. After installing the update, you should definitely manually check Windows Update. 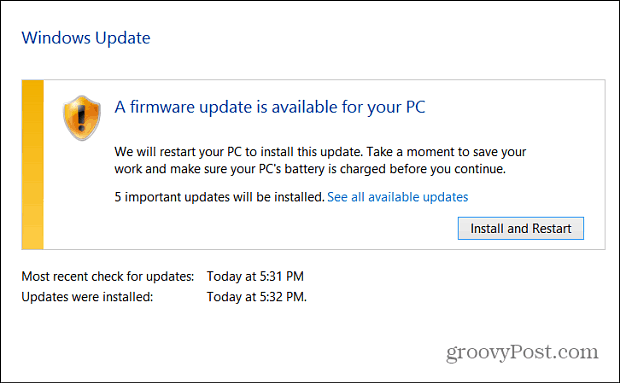 On my Surface RT I found five updates, including an important Firmware update for the tablet. In the end, all of my modern-style apps transferred just fine. On the laptop with Win 8 Pro, all of my files transferred over as well as the desktop program. There were a couple of minor apps I had to tweak, like setting my location in the Weather app, and resetting my signature in the Mail app … but nothing major. Now that I think of it, I should of backed up my app data specifically, but I will need to blow them all away again for the RTM. Overall it’s a painless experience, but when I upgrade to the final version – due later this year – it might be more of a challenge. 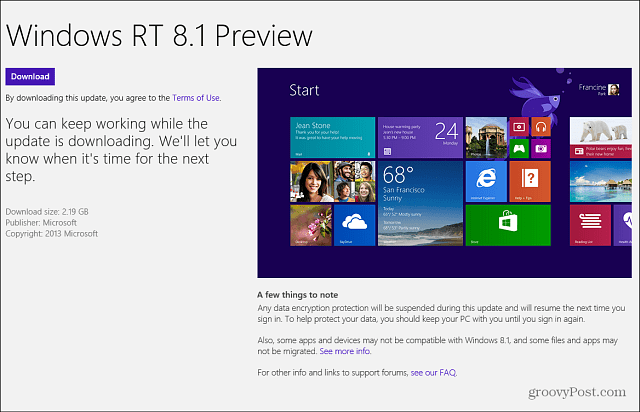 Have you updated to the Windows 8.1 Preview? How did it go? Leave a comment and tell us about your experience! Very nice that all you apps and data stuck around. That was my expectation. I’ve installed a million Microsoft updates and service packs and never been hurt by one of them. Can’t see why this would be any different. Probably wont upgrade however as I have just 1 laptop. I’ll be Microsoft will give an upgrade path but….. Just in case…. My computer is a hi end self build running Win8 Pro 64bit. Can’t find any answers for this problem? Looks like my PC can’t handle the update due to lack of updated drivers at the moment. after updating no activator working .. any idea? If I install the preview, will the install of thr final version be a simple update? Remember this is a beta … Public Preview, just like previous version of Windows 8 that came out before the final RTM version in previous years. So there will be bugs no matter what. Not everything is going to work correctly. In fact, since I have been using it more, I have had more app crashes on my Surface RT than normal, and have seen other oddities. That is why I make a point in these articles that experienced users are the only ones who should install it. I am not quite a hater of Win8 but it’s not a good OS and as a computer technician who’s clients are 50+ I always recommend staying with windows 7. Those who ignored my advise tend to regret buying win8 afterwards. This 8.1 update might help but for the average joe blogs in the street Win8 is a right mess with hard to find functions being hidden that it defeats the object of a good operating system which should be straight forward to use. The one thing I really like about Win8 though is the speed, it’s nice and fast.